I've been having back problems recently and the bed at the hotel destroyed any progress I had towards recovery. Waking up already unable to move put me in a not so great mood. Luckily there was a coffee shop across the road and right beside where we had parked our car. Their signature iced coffee was overly sweet in attempt to mask their low grade coffee. Cam's latte was too bitter to stand. The only decent thing to come out of there was the too greasy soaked ham and cheese. It was a quick trip out of town. Nothing exciting about the drive down the highway. We stopped at one point to take a break from the heat and have a snack at a McDonald's off the highway. What surprised me was the lack of water that was available. The cashier told me the light lemonade tap was water, but it was just as it was labelled. We did get a bag of ice to fill the cooler. The rest of the ice was used to cool the water bottle and my feet as we drove through the heat of the afternoon. We made a stop at a Walmart to get some aloe for me and a new laptop charger to replace the one forgotten in Santa Rosa. Made the mistake of letting Cam look the toy section. He insisted we get Star Wars Lego (for Wombie). Not far down the highway we saw a sign for a chance to drive through a living tree. Naturally we decided to explore the opportunity. It was hard to get a good photo with all the other tourists walking around. We picked up a few postcards from the tourist shop and continued on. 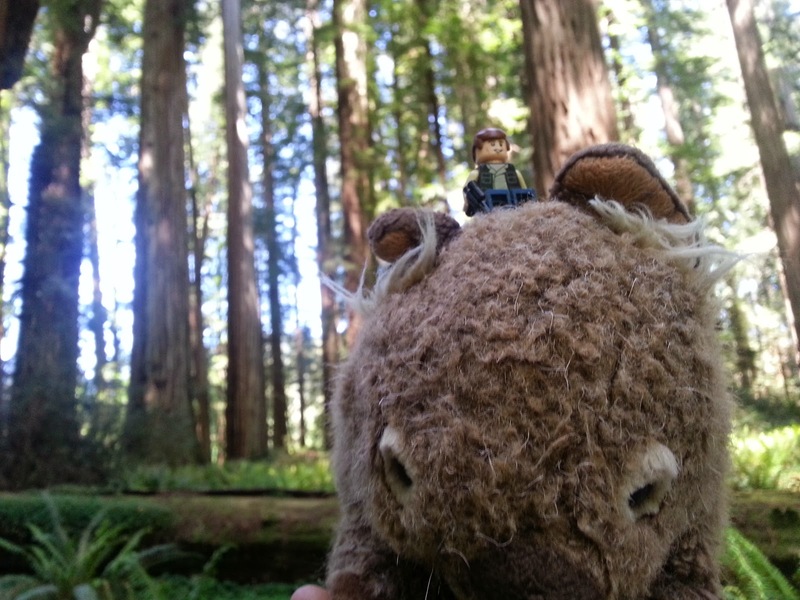 Further down the road we stopped to walk around Jedediah Smith Redwoods State Park aka the forest moon of Endor. It is really hard to show just how big the trees are. A few of them had fallen over recently, leaving huge holes where the roots had been pulled from the ground. The best part of the walk was that it was significantly cooler in the forest than it was on the road.